As religious fanaticism keeps brewing out of control, and international politics setting the stage for end time prophecy fulfilments, the importance of believers having fellowship around the Word upon which the apostolic ministry has established them can never be over-emphasized. Alongside this, the scattering of the gospel seeds of The Message still has to continue in hope that a few who haven’t yet come to receive the Truth will awaken to its reality. To this end I was scheduled to travel to Asia on a tight itinerary that would begin with visiting the Philippines, then Singapore, and from there to Cambodia and then finally home. Travelling to the Philippines was quite a long flight that saw me take off from Lusaka International Airport to Addis Ababa in Ethiopia. In Addis I waited for 2 hours for a connecting flight to Dubai. At Dubai airport I had to brave through 13 hours of waiting for a connection flight to Singapore. I was finally in the Philippines on 12th December 2014. I was received by Brother Orsel Vicente Dumanon, who was to be my host throughout the schedule. 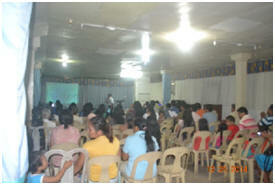 Our mission trip first took us to Leyte where we had a two days meeting at the fellowship of Bro Edgardo Resos. 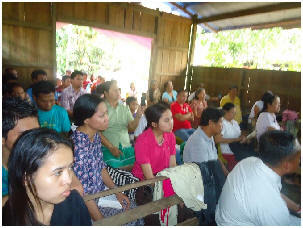 In Leyte I dwelt on a message series titled “Thy Will be Done” – an exhortation on how humanity in the beginning abandoned the Perfect will of God and has ever since experienced the pain and sorrows of that fateful decision, and how our repentance and surrender to the Lord’s will is what will assure us of the true peace of God, both in this present time and also the one to come when the world would have been delivered from the rulership of wicked forces of darkness. “You want me to tell you a story about Africa?” I asked them. “I became dark after drinking a lot of coffee”--- laughter. On and on the little sermon was preached to an attentive crowd. My accommodation in the village of Pili reminded me of some remote places in Africa where we have been doing some mission work. In Pili I felt very much at home with a people that were humble, poor and full of a welcoming and respectful attitude. I was home. Their love for fellowship around the Word of God was good. From Pili we travelled to Butuan City where the church of Pastor Orsel Dumanon is. 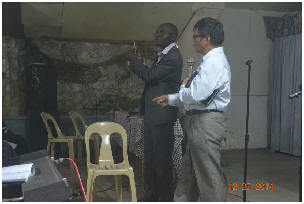 During my stay in Butuan I ministered to two other fellowships. These were one-day, “two-services” meetings. In one of the meetings I took time to speak about “Hearing a Voice and the Voice” – admonishing believers on the importance of having spiritual ears for discerning the voice of God in this present time when there are various uncertain sounds which all claim to proclaim the gospel. Charismatics have their prosperity gospel and various other denominations their own versions of Truth, but all the while living lives that do not manifest the simple life of Christ. We are admonished in 2 Peter 2:1 -3: “But there were false prophets also among the people, even as there shall be false teachers among you, who privily shall bring in damnable heresies, even denying the Lord that bought them, and bring upon themselves swift destruction. And many shall follow their pernicious ways; by reason of whom the way of truth shall be evil spoken of. And through covetousness shall they with feigned words make merchandise of you: whose judgment now of a long time lingereth not, and their damnation slumbereth not”. From Butuan City we travelled to Davao, on 16th December, where we had two services during which I spoke about the danger of pride and need for sincerity especially among ministers in the body of Christ. We live in a time when sincerity has waned as much fellowship among many Christians is so filled with hypocrisy and motives of getting recognized. After Davao, we travelled back by road to Butuan and then set off to Cagayan de Oro city (which I always misheard as ‘Cagayan the whole city’). This was a convention of different fellowships. I used the three days to present a message on the way of the Tree of Life, and took time to emphasize on the need of living the life of the word and not merely professing it; too much time is spent on politicking and yet there is little life of Christ that is lived among believers. It is not uncommon to see believers break up fellowship on petty issues. Many take “the unity of faith” as “unity of opinions”. Sadly, when discord and divisions occur in a fellowship, often it is innocent sheep that suffer the loss of healthy fellowship – all this because of egoistic pride of two or few other leaders. Indeed many “heads” (intellect) have been turned to the message but few “hearts” have been converted; for many it’s been merely a transfer from the world or denominations and not a transformation. After the convention in Cagayan de Oro I was scheduled to fly to Iloilo, but flight was cancelled due to bad weather (Philippines is prone to typhoons). So, I instead flew to Cebu from which I departed for Singapore. I would like to sincerely thank Bro Orsel Vicente Dumanon for the wonderful company and courtesy – always cheerful, understanding and helpful. It was a joy to be in company of his family and different believers who always made me really feel at home. I arrived in Singapore on Thursday, 1stth January 2015. This was completely a different world to me – its people and culture. Singapore is a city in a garden, hi-tech, too clean, and a country with a very efficient transport system. People here seem to be in fast forward in everything they do – you hardly hear conversations on a bus or train. Everyone is busy with his iPad or smart phone (quite different from the Philippines where I would occasionally conversate even with cheerful strangers). It was in this country where I had my first experience of being served Chinese meals. I could not finish the first meal that was ordered for me, and I didn’t know that that was being uncultured. Well, I was admonished to leave my plate clean after eating. Good culture, but not easy to adjust when you are not used to the type of food. And, it wasn’t just about adjusting to food and eating habits but knowing how get around the city – on your own – by reading maps and road signs. With my poor eye-sight and spectacles which had long expired, I had a hard time (I was later taken to an eye-clinic for new glasses). Luckily I am not into adventure. I love to use any free time to myself – reading, writing or listening to some recorded sermons. I was also very glad that I was staying in a home with an internet connection where I took much time to listen to video recorded sermons of the late Brother Raymond Jackson. I had longed for this for many years, as I had only been reading his messages in Contenders. The few days I would be alone to myself, I would feel very edified. On Friday, the following day after my arrival, I was glad to attend the weekly Bible Study fellowship of PROPHETIC REVELATION. On Sunday (4th January) I spoke about man’s search for the mind of God and mentioned certain issues going on in the God-debate (which I fully address in my book Forbidden Theology and on my blog – www.andrewcphiri.com). Whilst in Singapore I had the opportunity to visit a good bookshop where I was happy to buy books by C.S. Lewis and Watchman Nee. I find Lewis’ books stimulating to the intellect and Watchman Nee’s refreshing to the spirit. Besides spiritual books, I bought a good and informative volume of the memoirs of the founding father of Singapore – Lee Kuan Yew. I found important lessons in his memoirs, which I wish African leaders could read and learn from. Through his impeccable leadership qualities, the little city-state rose from a third world to a first world in merely 30 years, after it got independence in 1965 (from the Malay Federation). On 5th January I flew to the Kingdom of Cambodia. This was unfamiliar ground in all my missionary trips as the country is largely Buddhist in faith. English is not the official language. My host here was a Cameroonian brother – Israel Dume who works as a manager for Voice of God recordings there. My first meetings in this country were in small gatherings of Pentecostal churches. I first visited three close villages (about 10 minutes-drive apart). Here I had great difficulties to communicate as the translator hardly understood Basic English. When speaking I had to move from ‘simple’ to ‘very simple’ English sentences onto meaningless combination of words – from “Tree of knowledge of good and evil” to “tree of good and evil” down to “a tree with ‘good’ and ‘not good’ “. With this difficulty it was futile to go to great lengths teaching a message. I ended up only speaking for 20 or utmost 30 minutes. This left me frustrated at the lack of a proper interpreter. Even so, I felt a little encouraged when two elderly women at the end of the service desired answers to some questions they had regarding the Original Sin. These two women had a little understanding of English. After returning home from this province, we had a couple of days of non-activity until the brother decided to take me to another place (some six hours drive from Phnom Penh, the capital city). 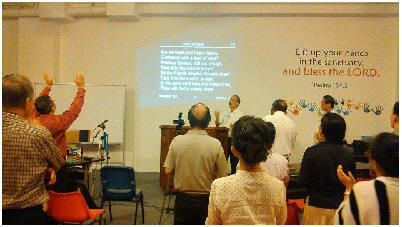 Here I was pleased to minister to a small group whose pastor and another church leader could speak fluent English. God’s grace was with us as we took time to look at the subject of the Original Sin. I wished had my whole stay in this particular place. However, it seems there is a need to scatter as much seed in different places as possible. Many thanks to Brother and sister Dume for their courtesy and efforts to plant the Message in these hard grounds of Cambodia. From Cambodia I flew back to Singapore. This time I took time to visit the S.E.A. Aquarium (although not into adventure and sightseeing, it was worthwhile taking time to go round this large aquarium. Interestingly I found myself watching some fishs caught from Lakes Tanganyika and Malawi). May I take this time to thank Brother Richard Gan and the church for their love and support. I returned home on 27th January (arrived following day), caught up in the noisy traffic congestions I had missed. Side mirrors and indicator lamps of my vehicle have just been stolen (we give thanks to God in everything – that’s what makes Africa interesting) and (at the time of writing this report) my wife is admitted at the hospital where we’ve had to wait for 12 hours in the queue before being attended to – in Africa they tell us to keep fit by standing for long hours – smile. Well, aren’t we glad that in everything we can still give thanks to the Lord? Amen.